Unsure of what to go as for Halloween? 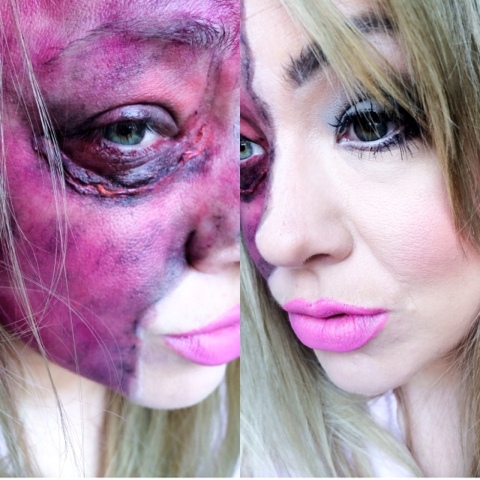 Want to go full out glam or gory and bloody? This look combines the two perfectly! 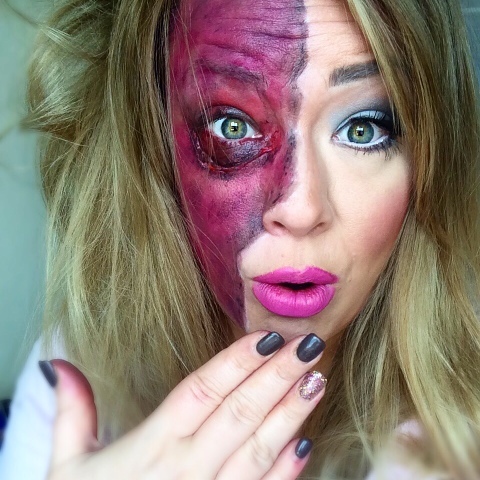 All the products used are from my make up stash, but if you have some special effects make up and fake bloody the look will be all the more realistic! For the traditional Barbie side I used all iconic Barbie shades like, blue eyeshadow and big bubblegum pink lips, all finished off with false lashes on the top and bottom and lots of pink blusher to give off that fake OTT makeup look. I also put white eyeliner in the water line and just below it to give the illusion of bigger more doll like eyes. For the "Burnt" side I started off by making the scar under the eye which was rolled up tissue fixed down with eyelash glue. If I was to do this again I would also place this down the centre of the face to separate the two sides and give it a more textured look. As for the rest, I simply used a makeup sponge that I had pulled pieces out of to give a stippled effect, and used alternate purple and red lipstick all over the face, and then darkened areas with a black gel liner. The sponge gives the appearance of veins and textured skin which I think works really well and looks quite effective. Looks amazing, i love this! This looks so good! I always like to combine scary with... 'normal' I was a dead alice in wonderland one year so this is right up my street! I love the tissue and glue idea, it looks great!